We support LS-DYNA and LS-OPT users in Germany, Austria, Italy, Belgium, The Netherlands, Switzerland, Spain, Portugal, Turkey and eastern neighboring countries of Germany. Our services include support, sales, development, process integration, training, and consulting. DYNAmore is dedicated to support engineers to solve non-linear mechanical problems numerically. Our tools to model and solve the problems are the finite element software LS-DYNA as solver and LS-OPT for optimization. 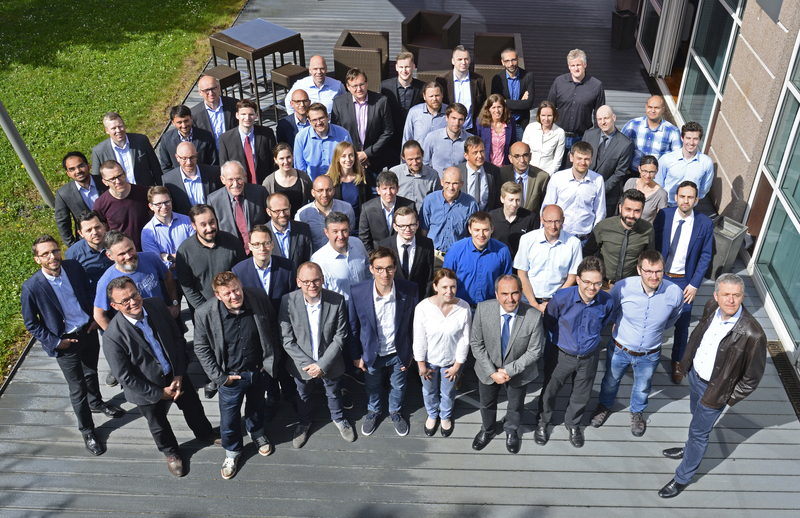 With 85 engineers in Europe we sell, teach, support, and co-develop the software and provide engineering services. DYNAmore is your contact partner for consulting, training, support and sales services concerning the finite element software LS-DYNA. The product portfolio consists of LS-DYNA, LS-OPT, LS-PrePost, GENESIS, additional complementary programs as well as numerous FE models for crash simulation. We are first choice for pilot and development projects concerned with the simulation of nonlinear dynamic problems. Secured and qualified support for all application fields, FEM calculation services and general consulting on the subject of structural dynamics are counted among our services. Our education offering covers a wide range of seminars, infodays and conferences. The services provided also include software development for finite element solver technology and simulation data management as well as consulting and support for modern, massively parallel computer systems. We are working with over 400 industrial companies and more than 150 universities in e.g. Germany, France, Austria, Switzerland, Italy, Sweden, Spain, Portugal, Turkey and the Benelux. 7of the 10 world wide largest automotive suppliers are our customers. All OEMs located in Germany are customers of DYNAmore. 7 of the 10 largest German automotive suppliers are our customers. The dummy models developed by DYNAmore are used by almost all OEMs world wide. The majority of suppliers for crash relevant parts in the automotive industry use LS-DYNA. The vast majority of German engineering services companies for the crash simulation are customers of DYNAmore. LS-DYNA is likely to be the most frequently used explicit finite element code. The DYNAmore GmbH has 60 employees, which are located in 5 offices in Germany. The percentage of female staff is above 29 %. The fluctuation of employees is with 2% very low. We work closely with our subsidiaries in Sweden, France, Switzerland and Italy. Our affiliated company SCALE works in the field of collaborative engineering for simulation. Together with the affiliated companies we are 120 people from 18 different countries. Prof. Dr. Karl Schweizerhof Karl Schweizerhof is involved in the development of LS-DYNA since 1985. He is Professor at the Karlruhe Institue of Technology KIT (formerly University Karlsruhe) . He is the head of the Institute of Mechanics, Department of Civil Engineering, Geo- and Environmental Sciences. Dr. Klaus Weimar Klaus Weimar supports LS-DYNA customers since 1988. He is actively involved in customization projects like the implementation of new material models and the porting of LS-DYNA versions. Klaus Weimar is leading the support services of DYNAmore. Dipl.-Ing. Kurt Schweizerhof Kurt Schweizerhof works with LS-DYNA since 1991. His main focus is user support in automotive applications. In addition, he has a vast knowledge in running LS-DYNA on massive parallel computer systems (MPP).